Your parties will NEVER be the same. 1. A vibrant stage light to brighten up your get-together with infectious flashes of color. 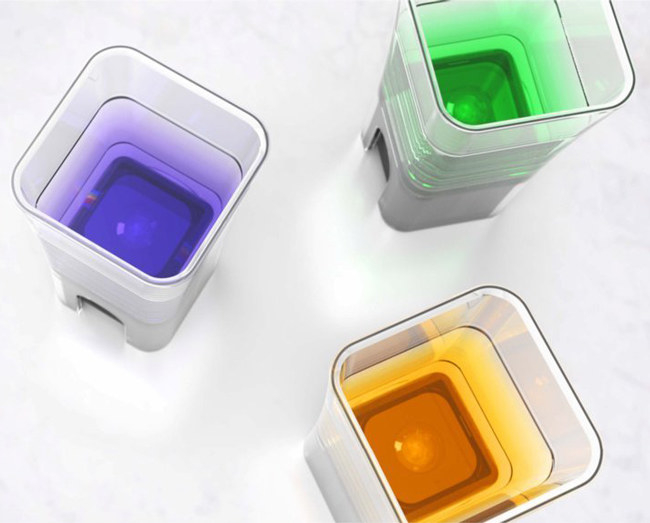 The light includes a mode that will automatically make it change colors to the rhythm and volume of the music being played. 2. A pack of shot syringes for when you’re sick of taking jello shots the regular way. The 25-pack includes a tray to hold them upright as they solidify in your fridge and for toting them around the room. And the syringes are specifically made for jello shots, featuring a long tip with an extra-wide opening at the bottom, so you can easily squirt out shots. Get a 25-pack from Amazon for $21.36 (also available in a 50-pack without the tray), Jet for $23.95, or Walmart for $30.66. 3. A pack of precious glass markers so you can stop stressing out about which wine glass or cup is actually yours. The pack includes 12 suction cup markers of different colors. They will stick to any glass or smooth surface and are dishwasher-safe. Just make sure to moisten the suction cups before placing them on your wine glass or cup. This will help them stick to the surface better. Get a 12-pack from Amazon for $6.51 (available in three styles), Jet for $6.51, or Walmart for $8.24. 4. A Drunk Stoned Or Stupid party game to call out your friends on both their foolishness and greatness. The game includes 250 prompt cards to uncover which of your friends is most likely to do something. To play, simply pick a card, read the card aloud, and decide which player fits that card and why. The person with the most cards at the end of the game loses. 5. An Oojra oil reed diffuser that'll fill your rooms with fragrant scents, putting your guests at ease no matter how wild the party gets. The 4 oz. bottle comes with reeds, fragrance oil, and a decorative bottle top. The oil should last for three to four months, which is dependent on factors like the humidity, dust, and temperature, of the space where it's placed. The kit also includes a tips guide, providing advice on ways to adjust the intensity of the diffuser's scent. Promising Review: “This product is very potent and fills the house with a wonderful fragrance. I love the French Provence Lavender scent because it is authentic French lavender, unlike many of the watered down products here. I lived in France for a long time and really appreciate. I will always reorder it!” —Nancy D.
Get it from Amazon for $39.99 (available in six scents). 6. A pair of dimmable Sengled Pulse light bulbs with a built-in bluetooth speaker you can plug into your lamp for a music experience your guests will think is pure magic. The bulbs — which feature JBL speakers — connect to your Amazon Echo or Echo Dot for voice control of your music from Amazon Music, Spotify, Pandora, iHeartRadio, TuneIn, and SiriusXM. You can also connect it to the Sengled Pulse app to control your audio, volume, and the light brightness from your phone, with the ability to link up to eight speakers at one time. The bulbs fit into standard E26 light sockets or fixtures. Get the two-pack from Amazon for $91.99+ (available in three colors), Jet for $84.86, or Walmart for $100. 7. An iridescent bangle flask, so you can take a little party with you when it’s time to move to the next location. And thankfully, it won't ruin your outfit one bit. The 4 oz. flask is made from stainless steel and features a twist-and-lift lid. Get it from Amazon for $29.69 (available in five colors) or Walmart for $12.89+ (available in three colors). 8. A What Do You Meme? card game, which will identify the true meme legend in your crew. Participants must pair caption cards with photo cards, with a rotating judge picking the best combination each round. Just remember, this game is for adults ONLY. So keep the little ones far away from the meme madness. Get it from Amazon for $29.99 or Walmart for $34.80. 9. A copper-colored string light that'll add some serious late-night drama over your mantel or doorways. 10. A Polaroid shot glass mount, perfect for using your Cube or Cube+ to see how dope you look while taking back a shot. The square-based mount holds your Cube or Cube+ tightly in place while you snap your bottom-of-the-glass videos or photos. You can watch a video of the shot glass in action by Michael Kwan on YouTube here. 11. A color-changing message board where folks can use liquid chalk markers to leave you some ridiculous drawings and notes. The 12"x16" board features seven LED light colors and 28 flashing modes with adjustable speeds. It also includes a USB controller, eraser cloth, metal chain, power adapter, and two fluorescent pens. 12. A The Game of Life board game so everyone can try their beautiful hot mess of a life over — at least for a few hours. Get it from Amazon for $13.44 or Walmart for $13.44. 13. A set of rechargeable bottle lights to illuminate your beverages in the coolest way. Plus, it'll make it easier to refill your glass if the lights are dimmed. The pack comes with four individual cork lights that can be charged with any standard USB cable. And you simply twist the corks on and off to activate the light. Get a four-pack from Amazon for $22.99 or two-pack from Jet for $23.71. 14. A pack of jumbo balloons that'll give a lovely rain of confetti if someone accidentally — or purposely — pops one. These balloons are perfect for big parties or more chill get-togethers, adding a fun touch to your festivities. The pack includes five 36-inch latex balloons and five bags of multicolored confetti. You must fill the balloons with the confetti before you inflate them, and make sure to fasten them tightly. The balloons can be inflated with air or 100% helium, and should be rubbed on carpet or another static surface to get the confetti to stick to the sides. Get a five-pack from Amazon for $10.98. 15. A pack of plush emoji keychains for a hilariously cute parting gift your visitors will have no complaints about. The pack includes 24 keychains in a variety of adorable emoji styles, including three amazing poop emojis. Get the 24-pack from Amazon for $11.99 (also available in a 30-pack and 54-pack). 16. A The Voting Game card game will reveal the messy opinions you have about your friends. Prepare to be shook and possibly pee your pants from laughing. The game starts off with the first question card being revealed. Players will then vote anonymously on who the question best describes. The results are tallied and revealed to the group. And each player can then guess who voted for them, with players getting one guess for every vote they received. If the player guesses correctly who put them down, then more drama may be sparked. Get it from Amazon for $24.99, Jet for $24.99, or Walmart for $24.99. 17. A pack of iridescent party plates and cups sure to convince everyone a unicorn will be your special guest at the function. 18. And some coordinating ombre napkins almost too pretty for wiping your mouth. Get a 16-pack from Amazon for $8.50 or Jet for $8.59. 19. A pack of color-changing, reusable straws that'll provide an unexpected surprise while people sip their drinks. The pack includes six 10.5-inch straws with a ring and six 9-inch straws that change colors in cold beverages. The straws are all BPA-free, and the set includes a cleaning brush. Get the 12-pack from Amazon for $10. 20. An extremely popular Super NES Classic or NES Classic so you and the besties can play all your fave throwback Nintendo games between jam sessions. The Super NES Classic comes with one controller and 21 pre-installed games, like Super Mario Kart and Contra III:The Alien Wares. While the NES Classic comes with one controller and 30 pre-installed games, like Super Mario Bros and Donkey Kong. Both systems can be be plugged into a HDMI TV with a HDMI cable. They are also both compatible with their corresponding Super NES Classic controller or NES Classic controller, depending on the system you purchase. Get the Super NES Classic from eBay for $88+ or NES Classic from Amazon for $218. 21. A pack of party crowns to separate your royal court from the other basics you invited — or maybe invited themselves — to your party. You will need invisible tape to secure the ends of the crown together once you’ve measured how it will fit on your head. Get a six-pack from Amazon for $8.89 or Walmart for $13.19. 22. A pack of Fujifilm QuickSnap disposable cameras for documenting your good times the old school way — and hopefully force your friends to set their phones down and enjoy your time together. A disposable camera is a nostalgic way to bond with your guests. You could use the camera for a photo scavenger hunt at your home or party venue. Or you can pass the camera around throughout the night, having people snap a few photos when it’s their turn to hold the camera. And it’ll be pretty damn fun to wait to have the photos developed and see just how great or ridiculous they turned out. Get a two-pack from Amazon for $12.99 (also available in a 10-pack, 20-pack, and 40-pack) or single camera from Jet for $8.55. 23. A Potheads Against Sanity game you can use to make some humorous memories out of your buzz. Players take turns asking questions or making fill-in-the-blank statements. And whoever comes up with the wildest answer wins. 24. A smartphone magnifier that’ll make is easier for everyone at the party to watch that YouTube video you refuse to stop talking about. 25. And a balloon modeling kit to gift your guests some inflatable party favors they’ll love forever — or until the cute little animals deflate. The kit includes a hand pump, instructional booklet, 32 multicolor balloons, and adorable eye stickers. Get it from Amazon for $9.90, Urban Outfitters for $16, or Walmart for $13.74. Now it's time to PARRRTAYYY.